Focusing on backhaul from a radio network viewpoint, Mobile Backhaul combines perspectives on mobile networks and transport network technologies, focusing on mobile backhaul specific functionalities, which are essential in building modern cost efficient packet networks for mobile systems, IP, MPLS and Carrier Ethernet. The key functions required for this process, Synchronization, Resiliency, Quality of Service and Security, are also explained. The reader benefits from a view of networking technology from a radio network viewpoint, which is specific to this application, as well from a data centre and more IT-oriented perspective. The book bridges the gap between radio and backhaul viewpoints to provide a holistic understanding. Organized into two parts, the book gives an advanced introduction to the principles of the topic before moving on to more specialized areas. Part 1 gives a network level overview, with the purpose of presenting the mobile network application, its protocols, interfaces and characteristics for the backhaul. This section also presents the key packet networking technologies that are most relevant for the radio network. Part 2 offers selected case studies in Synchronization, Resiliency, QoS and Security and gives example solutions for mobile operator owned and leased mobile backhaul cases building on the network view given in Part 1. Both radio network experts and IP networking experts will benefit from the treatment of essential material at the borderline between the radio and backhaul technologies. Esa Metsälä has held positions in Nokia and Nokia Siemens Networks in R&D, System and Business mgmt, Product Mgmt, Solution management since 1990. Esa is currently leader of Radio Network system specification team for transport, and also leads a feature screening team in Radio Network Transport product management. 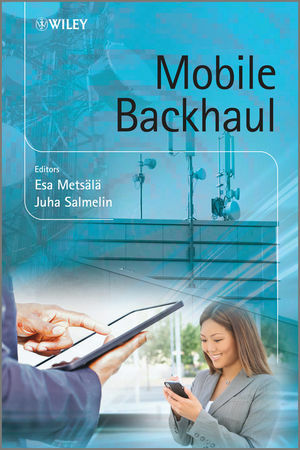 Esa has worked in teams responsible for mobile backhaul system level specifications for 3G/HSPA for over 10 yrs. Working in product mgmt, with a team, Esa has also been responsible for Nokia Radio Networks 3G transport solution and roadmap responsibility during System and Bus management era. Overall Esa has over 20 yrs of experience in the field. Esa has also given two conference presentations for HSPA. Juha has held positions in R&D at Nokia and Nokia Siemens Networks since 1988. Beginning from Asic designer of Microwave radios, Juha's positions have continued managing many different projects in transport product R&D. Team leader, department manager and Head of Technology roles in mobile backhaul products R&D including mobile backhaul e2e-solutions. Currently managing mobile backhaul in NSN Research, some key contributions include: Wireless and Wireline Backhaul Research, Micro Wave Radios, Mobile WiMAX, Femto Home Base stations for 3G, Mobile Backhaul Vision and internal White Papers, Backhaul technology roadmapping.